Before the craft beer era, and well into it, a common feature of the beer scene was to compare the same beer as brewed (or available) in two distant places. For example, Munich’s Lowenbrau became a locally-brewed, licensed beer in the U.S. in the 70’s. Somebody might get hold of the German original and bring it to a tasting to compare to the local one. Another example: James D. Robertson, in his circa-1980 The Connoisseurs Guide To Beer, compared Molson’s bought in Toronto with the imported one he could obtain in New Jersey. (Molson told him they were the same but Jim liked the one brought direct from Canada better). A version of this was to compare an import, Heineken, or Beck’s, say, with the same beer just off the plane from Europe; this was usually an eye-opener. We still do this today, even in the hyper-sophisticated and complex world of contemporary beer. Someone might bring a Goose Island Honker’s from Chicago and compare it to the one made in Toronto now. In fact, I may do this soon, as I have some local Honker’s and will be in the States soon where I can get the Chicago one – or at least an American one, since it is brewed in different places now by AB In Bev. 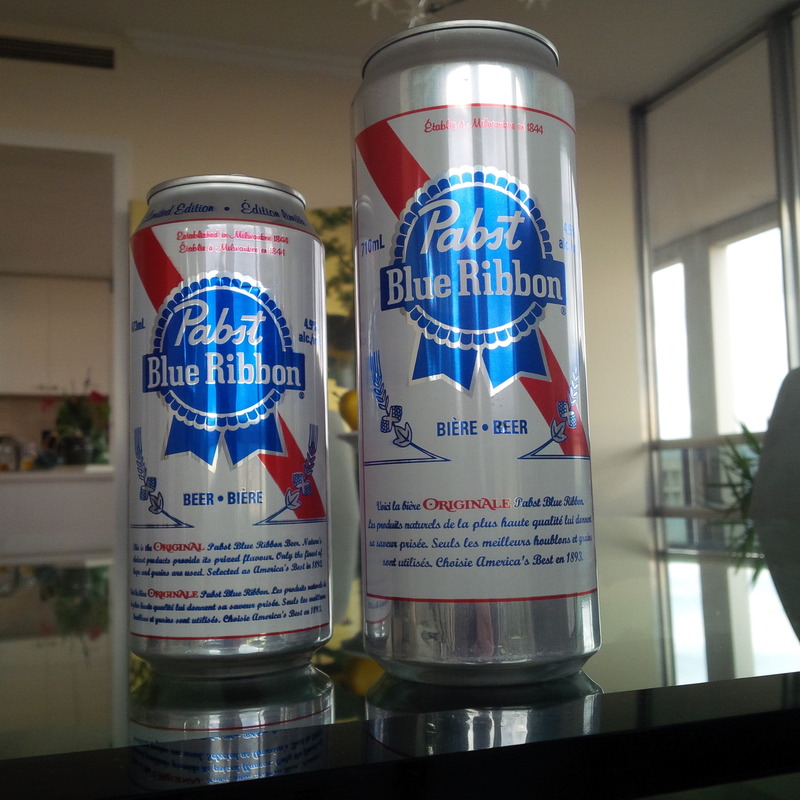 The extra-large can of Pabst Blue Ribbon you can get at The Beer Store in Ontario is brewed in the U.S., in distinction to the other forms of PBR available here. PBR is a famous old beer, one of the first national-scale lagers, and it had a premium image. I recall it in the 1970’s as having a pleasant, perfumed taste, quite different to today’s, but that’s another story. With the growth of the craft beer segment – i.e., the return to flavour which all beer had historically – PBR declined in profile, but then had an unlikely revival: it became a “hipster” beer, a commonly used but somewhat misleading description. Hipster implies a socially-aware young person, one in tune with trends. One would expect hipsters to favour craft beers, and many do of course. But the hipster community is not uniform. One of the sub-sets was more concerned with price and retro appeal than the myriad distinctions of the craft world with (often) prices to match. It is this group who took to PBR. While some have predicted a fall for PBR, the company’s website reports continued growth and enthusiastic reception by millenials. The beer looks possibly to become, or become again, an enduring American icon. And so, a long and winding path: from local (1800’s Milwaukee) hero to national icon to declining American adjunct beer to a niche exemplar of cool. What’s next? Well, calm appraisal under the eye of Beer et Seq, we will look at both the American one brewed at La Crosse, WI and the version made by Sleeman in Ontario. The outsize tin is the American, the other, the Canadian one. I found them rather different. The only thing that was similar was the unmistakeable high corn or other adjunct content, it lends a distinctive dry, starchy note familiar to most who know the elements of the beer palate. The American one was better, with a notable lager yeast smell, that typical sulphur note so many blonde lagers have around the world. Unfortunately (for me), instead of the sweet malty taste one hopes will follow as for any good helles, a keen flavour of corn seemed to dominate, as you might find in cornbread or popcorn. But still the taste was reasonably full and mildly sweet – recognizably a beer, the type that became popular in the later 1900’s when malt rates were reduced significantly and hops too. A well-made product by the standard of what it is. The Sleeman version had none of this lager yeast aroma – not necessarily a bad thing as I don’t favour the “sulphur springs” note. However, it had very little else going for it. The beer was very attenuated, meaning very dry, and had a chemical-like note, to my palate. It was as if you might blend seltzer water and Schweppes tonic water with a touch of toffee apple caramel added. I am sure many like these beers but they are not something I normally go for. So what to do? My answer, as many will guess here, is to blend them with another beer, one that has much more malt and taste. This evens out the flavours and, done right, reaches a stasis I find much more to my taste. I corked the bottle after a swallow or two. It is a good beer but the brewer must be a using a well-smoked or roasted malt as the beer had a strong “cured” taste, almost like some Scotch whisky. It was a bit dry, too, for the style, IMO. In Beer et Seq’s world, its best vocation, as for the PBRs, is blending. In a pint glass, I poured two thirds the PBRs combined, 2:1 American to Canadian, intentionally. 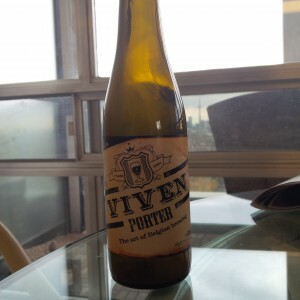 The third part was the aforementioned porter. This produced a perfect blend. Barley malt was evident while lightly modified by adjunct, which I’m good with (I don’t mind adjunct as such), and there was a lightly roasted tone throughout. The beer was a dark brown with reddish highlights, and rather, in flavour not colour, like Aecht Schlenkerla Helles Lagerbier from Bamberg which has a lightly smoky note. The PBR oil cans are still in the fridge, each about half-full. (I leave any can of beer opened for 2-3 days with blithe unconcern – there is so much CO2 to begin with that the amount which bleeds off usually works to the beer’s advantage, with plenty of gas left). Tonight or tomorrow, I’ll do a blend like the first one, but using Sinha Stout for the one-third which is highly flavoured. This is the fine, almost Imperial stout from Sri Lanka, the former Ceylon, the brewery was established by British colonials in the 1800’s.